This translation of the Meditations is by far the best stylistically. Marcus never intended for his journals (which is what the Meditations are) to be published and was writing to himself. Why would someone writing to themselves write in a technical manner reminiscent of a modern philosophical treatise? Why? Because that was the style in which ancient philosophy was translated in the early 20th century. Marcus scolds those who obsess over rhetoric, grammar, syllogisms and logic crunching within the Meditations and for a very clear reason: he is concerned with a human message, primarily centered around ethics and pursuit of virtue, not any abstract theorizing common to the pretensions of imitation philosophy. 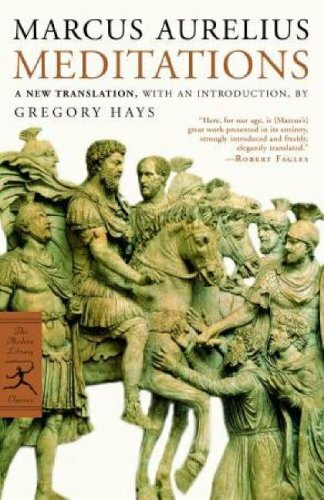 It is absurd to assume Marcus would have wrote to himself in such a lofty, holier-than-thou, technical and abstract fashion (see: the “standard” George Long translation). It is more likely that Marcus would have been influenced by the language of Epictetus, and if the Discourses and Enchiridion as relayed by Arrian are any clue, the language of Stoicism at this time was quite accessible to the common reason. Hays offers a natural translation of the Meditations with immediacy, warmness, humanity and stunning beauty, truly bringing to life the eternal wisdom of the philosopher king. Marcus’ words are presented in an almost poetic fashion which inspires the reader to greatness and contemplation in pondering the core themes of transience, goodness and service. The type of man Marcus was, and the type of virtue he advocated, is sorely missing in today’s society. Prudence, temperance, fortitude and justice as character traits seem to be gone from the world and only found in the writings of dead Greeks and Romans. But in reading these texts the virtues are reborn, as is the “Greek lifestyle” of austerity, civic duty and integrity, at least in the mind and heart of the reader. The Meditations is all about how to endure the stresses of the world while coming out on top of them even stronger than before, and even more excellent. I found Marcus’ words to be a godsend in times of hopelessness and longing as I discovered that the things which caused me grief were only temporary in nature, were outside of my control, or were irrelevant considering the immense scope of the cosmos (time) and our minute proportion of it. This is amazing work. Thanks for your efforts reading it and for making it available.